Indian Zoroastrian (Parsi or Parsee and Irani) weddings are called a lagan in the Gujarati vernacular. The Parsees (Parsis) immigrated to India from Iran over a thousand years ago following the Arab invasion of Iran. The Irani Zoroastrians of India immigrated during the last two or three hundred years. Some Irani Zoroastrians continue to have relatives in Iran. According to the story of the Parsi / Parsee migration to the state of Gujarat in India, the Kisse Sanjan, one of the conditions imposed by the ruling king of Gujarat, Jadi Rana, for allowing the refugees to settle in his kingdom, was that the Zoroastrians would perform marriage ceremonies in the evenings, just after sunset, and that the women would wear the clothes of local women, namely saris. Indian Zoroastrian weddings and pre-wedding festivities can be quite elaborate, and regardless of size, they are joyous and fun-filled occasions. The rituals, ceremonies and festivities related to a wedding start as soon as a couple decide they want to marry. While in the past, families played a significant role in introducing prospective partners from within the community, nowadays, Zoroastrians for the main part find their own partners. In the west, these partners are often individuals from other communities. 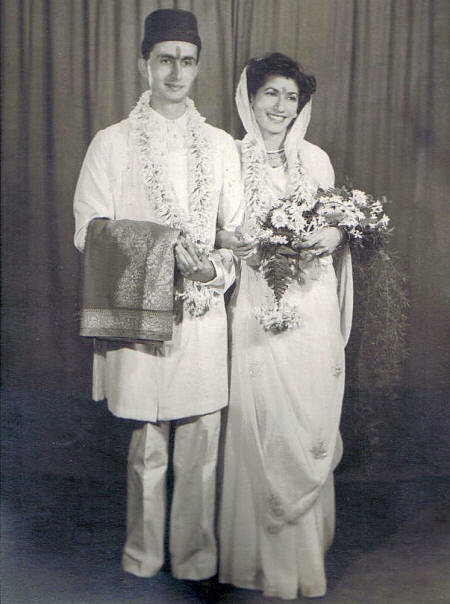 There is a trend for Indian Zoroastrians to marry in their twenties and sometimes even later. This is because Zoroastrians by and large wait until they have graduated from university and have settled in a profession. A corollary is that Zoroastrian families are having fewer children and there are more deaths than births in this emancipated and highly educated community. As a rule, when Zoroastrians decide to marry, they inform their parents and seek their parents’ approval. Approval is usually forthcoming, unless of course, the parents feel a marriage would be harmful or ill-advised for some reason overlooked by their daughter or son. It is not uncommon for the parents of both parties to engage in a conversation between themselves to discuss the intentions of their children. If the parents’ consideration is objective and made in the best interests of the couple-to-be, their advice can be invaluable in preventing errors of judgment and short-lived marriages. Once the parents give their blessings, the rupia peravanu ceremony is arranged at the earliest date. Rupia is a word for the Indian currency – the rupee. 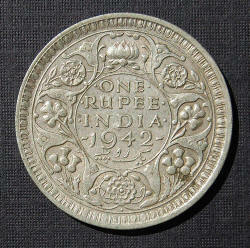 Until just over fifty years ago, the rupee was made from silver. The ceremony marks the start of the two families coming together to bless and support the couple, and takes place at the bride-to-be’s family home. 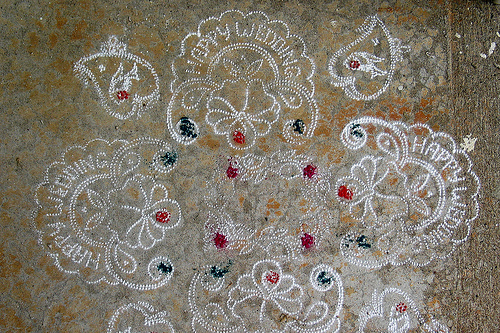 In preparation for the rupia peravanu ceremony, the bride-to-be’s family home is thoroughly cleaned and the main doorways are decorated with torans and chalk designs. Torans are placed along the top frames of the doorways in a manner similar to a decorative valance, and can be made from flowers, knitting, embroidered cloth or beads. The photographs above, to the right and below, show examples of different kinds of torans. 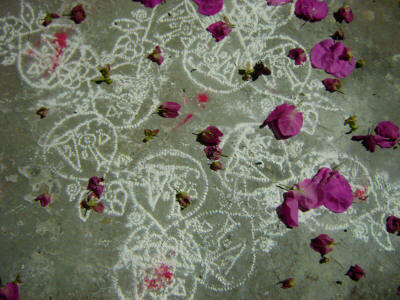 Designs stamped from powdered chalk, sometimes called chuna or rangoli, festoon the floor on all sides of the doorway. Inside doorways are also decorated. The visiting entourage from the groom-to-be’s family consists of five to seven (and a maximum of nine) women to give the bride-to-be a gift of silver coins placed in a red brocaded bag. They may carry a sace or ses with them containing a selection of items including the gifts. The visitors are greeted at the door by the intended bride’s mother or eldest woman relative, who performs the achu michu ritual on the visitors. While the ritual is performed to ostensibly remove evil and the evil eye – that is, impediments to a successful marriage – the sentiment is more towards sanctifying the occasion and encouraging positive feelings. At the conclusion of the achu michu, the bride’s mother invites the visitors to sit in the living room where tea and refreshments are served. At the conclusion of the sharing of refreshments, the groom’s mother ceremonially gives the son’s intended the gift of silver coins. This can be done by the groom’s mother asking the bride-to-be to stand on a spot designated by chalk designs, garlanding the bride and placing the bag containing the coins in her hand. It is now the groom’s mother’s (or older female family member) turn to perform the achu michu ritual on the visiting group from the bride’s family. The exchange of silver coins is a token of the two families’ agreement and commitment to the marriage. The exchange of visits and blessings formally demonstrate the families’ support for the couple and their decision to marry. The ceremony also marks the start of the planning process for the wedding ceremony that includes the fixing of a wedding date. At a convenient time following the rupia peravanu ceremony, the couple and their families get together to decide on the engagement and marriage dates. For the orthodox, the day of the month according to the Zoroastrian calendar plays an important role in the decision-making. A few also consult an astrologer who suggests dates based on a horoscope (a common practice amongst the Hindus). Auspicious days according to the Zoroastrian calendar (Shenshai, Kadmi or Fasli) are the first day (Hormazd) or the twentieth day (Behram) of the month. Once the families finalize their plans and have time to acquire and accumulate engagement gifts, the date for a ceremony to mark the formal engagement or betrothal is fixed. The adravanu is the time when the groom-to-be’s family give the bride-to-be a new set of clothes, accessories and jewellery. It is followed by an engagement ceremony. Generally, this ceremony is performed at the bride-to-be’s family home, though the ceremony can also be performed at the groom-to-be’s family home. As with the rupia peravanu ceremony, the doorways of the two homes are decorated with torans and chalk designs. Some families light an oil lamp called a devo early in the morning on this day. If the theme of the rupia peravanu was silver coins, the theme of the adravanu is fire – adra meaning fire. The theme is reflected in the lighting of lamps and the red colour of the sari and bangles gifted to the bride-to-be. When the groom’s family arrives at the bride’s family home, they are greeted in a fashion similar to when they arrived for the rupia peravanu ceremony. If the ceremony is planned to go beyond the giving of gifts to an engagement ceremony, the visiting group includes the groom and other close male relatives. The bride’s party welcomes the groom’s party with song and amidst the song, the bride’s mother or senior woman relative garlands the visitors. The adravanu ceremony starts with the devo ritual. A devo, or oil lamp, is lit by the groom-to-be’s mother who also puts a silver coin in the devo after which she asks the bride-to-be to stand on a stool called a patlo, stepping first with her right foot. 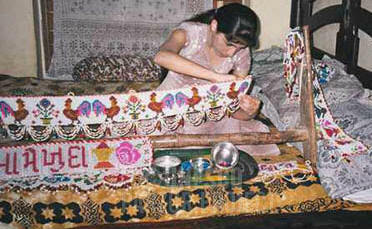 The stool is decorated with chalk or rangoli, designs. The groom’s mother performs an achu michu and presents the bride-to-be with gifts that include a red sari and bangles. The bride-to-be retires to change into her new clothes aided by the other women folk who, if playful, will sing as they wrap the sari around the bride-to-be. On her return, she is invited to stand on the patlo again and this time the groom’s mother then places red bangles on the bride-to-be’s arm. 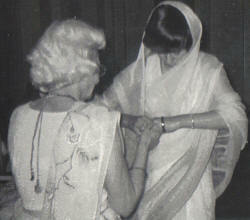 In earlier days, placing the bangles had the same significance as the exchange of rings has today. The groom-to-be is now invited to join his intended on the patlo and the two mothers or the eldest woman relative from each family take turns performing the sagan ritual. In the sagan ritual, a coconut is placed in each of their right hands and a garland is placed around their necks. The officiating woman then dips her thumbs into a small metal bowl containing kunkun (sometimes called kumkum) or vermillion paste and touches both their the shoes with her thumb, leaving a red spot of kunkun on their shoes. Next, she places the vermillion paste on their foreheads, making a round mark on the bride-to-be’s forehead and a vertical mark on the groom-to-be’s forehead. The concluding act of the sagan ritual is the placing a piece of sugar crystal, sakar, dipped in yoghurt in the couple’s mouths to encourage sweetness in their communication. 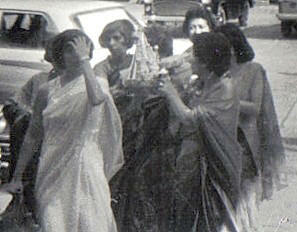 After both mothers have performed the sagan ritual, the couple exchange engagement rings. Family members and invited guests then come up and present the couple gifts – usually envelopes of cash for both of them. In Zoroastrianism, when a man and woman take part the engagement ceremony, they are implicitly engaging in an exchange of promises witnessed by the angel Mithra, guardian of promises and contracts. The promises are binding and on the pain of damnation, cannot be broken in normal circumstances.